Data Mining for Business Analytics: Concepts, Techniques, and Applications with JMP Pro® presents an applied and interactive approach to data mining. uses engaging, real-world examples to build a theoretical and practical understanding of key data mining methods, especially predictive models for classification and prediction. Topics include data visualization, dimension reduction techniques, clustering, linear and logistic regression, classification and regression trees, discriminant analysis, naive Bayes, neural networks, uplift modeling, ensemble models, and time series forecasting. 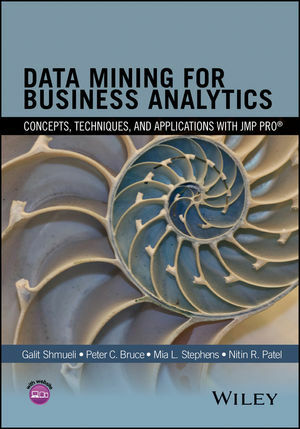 Data Mining for Business Analytics: Concepts, Techniques, and Applications with JMP Pro® is an excellent textbook for advanced undergraduate and graduate-level courses on data mining, predictive analytics, and business analytics. The book is also a one-of-a-kind resource for data scientists, analysts, researchers, and practitioners working with analytics in the fields of management, finance, marketing, information technology, healthcare, education, and any other data-rich field.